On Saturday I visited my dad and his brand new Big Green Egg. He's gone headlong into this hobby with some rather ambitious projects right off the bat. 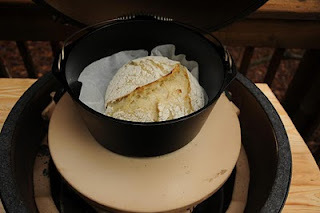 Already I'm coveting his cast iron Dutch oven, which he's used to make some incredible bread. 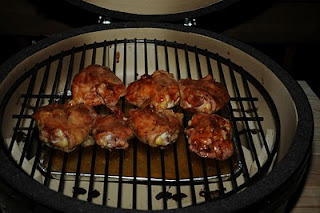 I arrived at my parents' house to find the bbq chicken thighs almost done. My 20 month old son was in my arms. He's already an avid griller and has to see what's going on when I'm out cooking. As my dad opened the lid my son peered into the Egg to see what was going on. Man, it smelled good. I look over and my son has drool coming all the way down his front and onto my arm. Some poker face he has. Here's the recipe for the chicken. I looked over a printed recipe for the bread while at my folks' house, but don't have it here to post. I'll try to get hold of it. Both the bread and the chicken were outstanding. Way to go dad! Sauce: saute onions in butter until brown. Add remaining ingredients and simmer for 15 minutes. Time for some bread this weekend, thanks for the inspiration.